It is well known and acknowledged that IQ correlates with social outcomes (Herrnstein & Murray, 1994; Jensen, 1998; Gottfredson, 1997), measures of health (Gottfredson, 2003, & Deary, 2004; Reeve & Basalik, 2010), wages (Jones & Schneider, 2008), savings (Jones, 2012), job performance (Ree & Earles, 1994; Hunter & Schmidt, 2004), training success (Ree & Earles, 1991), general knowledge (Reeve, 2004), general economic peformance (Jones & Schneider, 2006; Jones, 2011, 2012; Hafer & Jones, 2012; Meisenberg, 2012; Kalonda-Kanyama & Kodila-Tedika, 2012), and this, without mentioning other many correlates of importance (Lynn & Vanhanen, 2012). But IQ critics usually claim that correlational studies tell us nothing about the causal link. The present article will introduce some research on this topic. McKay & McDaniel (2006, p. 546) as well as te Nijenhuis & van der Flier (2005) demonstrate, by way of method of correlated vectors, that the cognitive loading of the jobs performed correlated in fact with racial differences. Complexity of the job increases with black-white differences or with minority-majority differences. This is fully consistent with the Spearman-Jensen theory, to the extent that differences increase with g (Jensen, 1998, pp. 377-378). This shows that the importance of g is not reduced to the within-group dimension. Jensen (1998, pp. 276-277, 280, 283, 286) tells us that subtests’ g-saturations of cognitive batteries are correlated with predictive validity coefficients (i.e., correlation with measures of social outcomes) of those same subtests. In the same way, NLSY97 data shows that ASVAB subtests’ g-loadings correlate with their correlations with (GPA) grade point average (Hu, Sept.21.2013). This holds true whether we look at the black, hispanic or white sample. Furthermore, controlling for both parental income and parental education reduces this correlation just a little. However, if past research demonstrates the preponderance of g (e.g., Ree & Earles, 1991, 1994), it remains possible that the importance of specific/narrow latent abilities had been underestimated. Reeve (2004) tells us that previous methods employed failed to properly isolate specific cognitive latent factors from the general cognitive latent factor due to variances attributable to random measurement errors : “Often studies of cognitive abilities have relied on the observed subscales of a test (as defined at the discretion of test constructor) as a construct-valid surrogate for narrow ability constructs (e.g., Hunter, 1986; Thorndike, 1991). … studies of the validities of narrow abilities often estimate these factors with the variance due to g included. Thus, the correlations with outcomes reflect both the variance due to g as well as the unique variance due to the specific factor.” (p. 625). Thus he proposes the use of latent variable models with structural modeling equation (SEM) since they would evaluate more precisely these specific abilities (i.e., the latent (non observed) factors are deemed to represent the variance shared by the observed (measured) variables included). The conclusion of his analysis (pp. 635-639) is that the general cognitive latent factor is the predominant predictor of general (not narrow) knowledge, that the specific cognitive latent factors add no additional variance to the general knowledge factor, that the specific factors had correlations with some domains of specific knowledge even if some of these structural path coefficients approach zero. The importance of specific latent abilities on specific criterion of knowledge having been established, he noted : “Although narrow abilities may be important predictors of some narrow criterion factors, this does not necessarily indicate that these criterion factors are practically meaningful. Indeed, the general knowledge factor, which was predicted solely by g, accounts for the majority of the total variance underlying the criterion construct space. Thus, the narrow abilities, despite their evident psychological significance, may only have practical significance in situations where the range of general ability has been restricted (e.g., among a group of doctoral graduate students, where prescreening produces significant range restriction in g).” (pp. 639-640). Finally, one limitation of his study is that some tests of knowledge used had a low reliability and this could have limited somewhat the relationship between factors of specific knowledge and specific abilities. Reeve (2004) and Coyle (2013) noted that because non-g factors or residuals predict narrow abilities, this pattern is not inconsistent with the investment theory for which non-g ability is assumed to reflect specific skills that contribute to specific abilities. Investing in skills in one domain comes at the expense of developing abilities in other domains, thus producing negative relations between these skills and those other, competing abilities. As noted by Schmidt et al. (1981), theory-driven research should examine validities at the true score or construct level. The true-score level refers to the relationship among the constructs free from measurement error and other statistical biases. Examining validities calculated on imperfect measures often produces an inaccurate picture of the relative importance of the abilities themselves. This occurs because partialling out imperfect measures does not fully partial out the effects of underlying constructs (Schmidt et al., 1981). To illustrate, suppose that Ability A is a cause of training performance but Ability B is not. Suppose further that the tests assessing these abilities have reliabilities of .80 and are positively correlated (as occurs with all mental ability tests). Because Ability B is correlated with Ability A, Ability B will show a substantial validity for training performance. Moreover, because Ability A is not measured with perfect reliability, partialling it from Ability B in a regression analysis would not partial out all of the variance attributable to Ability A. Thus, the measure of Ability B will receive a substantial regression weight when in fact the construct-level regression weight is zero. That is, Ability B will predict training performance even though it is not a true underlying cause of training performance. In this case, Ability B will appear to increment validity over Ability A only because of the presence of measurement error (see also Schmidt & Hunter, 1996). Three levels of abilities can be distinguished : specific aptitudes (6 ASVAB subtests), general aptitudes (3 latent common factors as the sum of previous six ASVAB subtests), GMA (the equally weighted sum of the 3 general aptitude scores). The authors attempt to test whether specific mental abilities have increment validity for predicting performance above and beyond general mental ability (GMA or g). The specific aptitude theory would predict the pattern displayed in Figure 2 to be the best fit model over Figure 1 while g-theory predicts no better fit for Figure 2. But in fact, the inclusion of either general or specific aptitudes yields no prediction gain over and above GMA itself. Moreover, as expected, g has higher validity in training programs of higher complexity. The critics once claimed that experience in work will become more important over time, but the data shows the opposite. The correlation between experience and performance declines over the years (Schmidt & Hunter, 2004, p. 168) and when job complexity increases (Gottfredson, 1997, p. 83). Furthermore, the predictive validity of IQ (g) does not decline with increases in levels (years) of job experience. Evidence that complexity in IQ was the chief ingredient in the correlation of intelligence with success is provided by Ganzach et al. (2013) findings that occupational complexity (and hence high-IQ persons) mediates the correlation between g and income, and that job complexity mediates correlations between IQ and job performance (Gottfredson, 1997, p. 82). The decline in standard deviation (SD) in IQ scores with increasing occupational level also supports this interpretation (Schmidt & Hunter, 2004, p. 163) as it indicates that success is closely related to g, through an increasing minimum cognitive threshold. Another piece of evidence (Schmidt & Hunter, 2004, p. 163) comes from longitudinal studies showing that earlier IQ predicts (later) movement in job hierarchy. Lower-IQ persons move down. Higher-IQ persons move up. Furthermore, when persons’ IQ exceeded their job complexity level, those persons will move up into a higher-complexity job, and vice versa. Ganzach (2011) reached similar conclusions; SES affects job-market success only through entry pay whereas IQ exerts its effect mainly through pay trajectory. Again, this pattern is more consistent with causal-IQ theories than with social theories. While the critics invoke the general idea that the correlation between IQ and social outcomes is superfluous because it was confounded by socio-economic status (SES) and other familial-related influences. The problem is well understood when testing the said hypothesis. Murray (1998) showed previously in a large sibling study that the sibling having the highest (lowest) IQ will end to a higher (lower) level of socio-economic status relative to the other. Obviously, because siblings share the same parents and thus familial influences, SES-related arguments must be discarded. 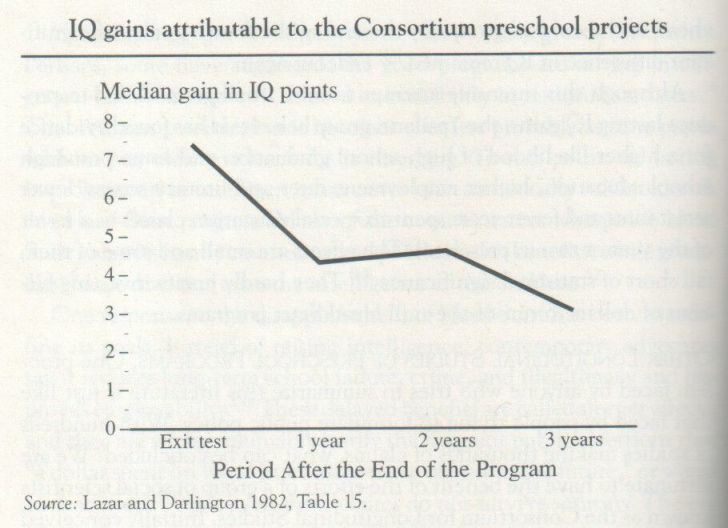 In parallel, the fact that SES has no considerable impact on the correlation between IQ and scholastic tests is justified by the partial correlation analyses (with SES partialled out) that tend to reduce just slightly the initial bivariate correlation (Jensen, 1980, p. 336). Also, IQ correlates more with adult’s attained SES than with his parents’ SES (Jensen, 1973, p. 236, 1998, p. 384; Herrnstein & Murray, 1994, ch. 5 and 6; Saunders, 1996, 2002; Strenze, 2007, Table 1, fn. 9). This suggests of course that parental SES is not the driving factor but instead that IQ is determing SES, more than the reverse. This is consistent for example with the failure of adoption studies (e.g., Capron & Duyme, 1989, 1996) to show a Jensen effect (i.e., relationship with g) on adoption gains when low-SES abused children had been adopted by rich families (Jensen, 1997; Hu. Feb.19.2013). A similar conclusion could be drawn from the path analysis that has been done by Rice et al. 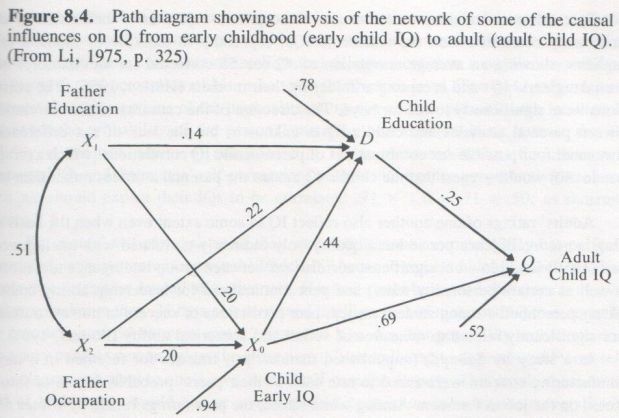 (1988) who report that environmental familial influences, measured by indices of HOME, on children’s IQ, show direct environmental effects at 1 year of age, and then direct environmental effects as well as indirect genetic effects through parental mediation at 2 years of age, and then only indirect genetic effects at 3 and 4 years of age. This would suggest that environmental influences must be more effective at earliest ages (infancy rather than early childhood). All this must be considered with the fact that educational interventions usually fail to improve g on the long run (see, Ritchie & Bates, 2013). Suppose you have a friend who is a much better athlete than you, possessing better depth perception, hand-eye coordination, strength, and agility. Both of you try high-jumping for the first time, and your friend beats you. You practice for two weeks; your friend doesn’t. You have another contest and you beat your friend. But if tomorrow you were both to go out together and try tennis for the first time, your friend would beat you, just as your friend would beat you in high-jumping if he practiced as much as you did. Furthermore, Gottfredson points out (1997, pp. 86, 91-92, 108) how it is difficult to reduce individual differences in performance by way of training and learning, insofar as those differences can be magnified instead of decreasing (see also, Ceci & Papierno, 2005). The reason is that intelligent people learn at a faster rate, even when all employees were exposed to the same instruction. Needless to say, this is entirely consistent with the concept of a causal g but not with theories implying that g is built from the outside. Now, regarding the possible mechanisms related to IQ-achievement correlation, processing speed is likely to be a good candidate. According to Jensen (1998, 2006), processing speed could well be the purest manifestation of g insofar as it reflects the quality of information processing in the brain which is important in light of the Spearman’s hypothesis because it seems that ECT mediates black-white differences on IQ (Pesta & Poznanski, 2008). We already know there is a significant correlation between IQ and processing speed (Jensen, 1998, pp. 234-238, 2006, pp. 160, 171-172, 195; see also, Grudnik & Kranzler, 2001; Sheppard & Vernon, 2008), that this correlation was almost entirely mediated by genetic factors (Jensen, 1998, p. 233, 2006, pp. 130-131; Lee et al., 2012), that elementary cognitive tasks are less amenable to cultural, learning and personality factors (Rindermann & Neubauer, 2001) while the latter did not predict processing speed (see also, Jensen, 2006, pp. 175-178), thus making these tests an even better measure of intelligence. And yet we had to determine the causal mediation. First of all, Luo & Petrill (1999) showed that psychometric g and chronometric g are similar in the sense that the intrinsic nature of g is not altered when ECTs are added to the traditional psychometric tests. It also appears that the memory processing component contributes substantially to g estimates. Next, Luo et al. 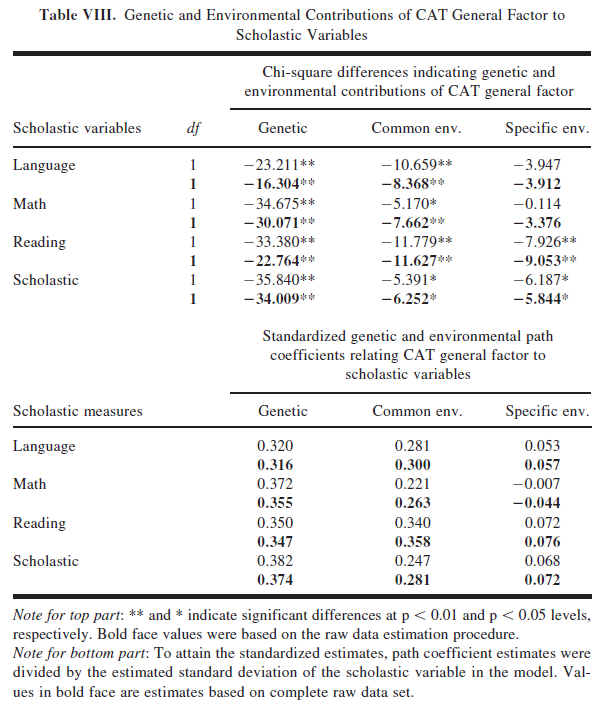 (2003a) found that CAT group factors (as opposed to the general factor) are not important in predicting achievement (measured by MAT), while at the same time the g factor derived from CAT (call it CAT-g) affects achievements measures essentially through the genetic paths, as assessed by the more substantial Chi-square changes (to assess model-fit) for the genetic path than for the shared and non-shared paths (Table 8 below). Subsequently, Luo et al. (2003b) were able to demonstrate that psychometric g, as measured by WISC (call it WISC-g), while being correlated with achievement (MAT variables), was substantially mediated by processing speed (as measured by CAT). In addition, some nonchronometric, memory processing measures had high loadings on the mental speed component. Overall, such findings were coherent with Jensen’s theory of mental speed (see, Jensen, 2006, pp. 212, 216-217, 224, 226-227) which also predicts synergistic interaction between memory processes and speed. The reason could be that information processing speed allows one to consolidate more of the informations to which they are exposed in long-term memory (LTM). Besides, the concept of consolidated IQ gains vs. non consolidated gains had been explicited by Jensen long ago (1973, pp. 79-97). Consistent with Dasen Luo’s conclusions, Rindermann & Neubauer (2004, pp. 581-586) estimated that the direct effect of processing speed of information on scholastic performance while being significant was weak compared to the indirect effect (mediated through intelligence and creativity). As shown by Rindermann et al. (2011), mental speed bears a non-trivial relationship with writing ability, controlling for intelligence and parental education and books at home, even though the impact of intelligence is much stronger than speed, when a latent variable approach is conducted. Although parents’ education and books at home draw a pathway towards mental speed, the authors assume that they can have such impact only through a genetic-biological (not environmental) pathway (see Luo et al., 2003a) because mental speed must depend on a basic biological component (e.g., Penke et al., 2010). In a similar vein, Rohde & Thompson (2007) have been able to show that specific cognitive abilities such as processing speed, working memory, and spatial ability, affect in an indirect way the scholastic performance (as measured by GPA, SAT-verbal, SAT-math, WRAT-III) through intelligence (as measured by Raven and a Vocabulary test). When specific cognitive abilities had been controlled, general intelligence still add to the explained variance in scholastic performance; also, when measures of general intelligence had been controlled, specific abilities do not account for any additional variance to the WRAT and GPA but add to the prediction of SAT. Having noted this, the authors explain that specific abilities can still affect academic performance beyond general cognitive ability. Another study, by Vock et al. (2011), reports that mental speed only has an indirect impact on the academic performance through reasoning and divergent thinking (DT, an index of creativity) while short-term memory (STM) had both direct and indirect influences (through reasoning and divergent thinking). Direct paths from mental speed to achievement performance were not significant. Interestingly, the indirect effect of mental speed diminishes when short-term memory had been included in the model because, as they say, these two variables share common variances. The authors recall however regarding short-term memory that only the active storage (as opposed to passive storage) serves as a good predictor of general cognitive ability or scholastic performance. Besides, the relationship is not expected to be distorted by timed testing as demonstrated by Preckel et al. (2011) when they found divergent thinking (DT) and reasoning ability to be mediated by mental speed. Finally, the only exception comes from Dodonova & Dodonov (2013) who failed to replicate previous research. They instead found that processing speed and intelligence have each unique contribution on school achievement. The importance of processing speed as a mediator of g has been highlighted by Coyle et al. (2011) in the large NLSY97 sample. They found that the direct path from age to the development of g was not significant. Instead, the improvement of processing speed (PS) was associated with increases in g (over the course of development) and the effect of age on g was virtually fully mediated by processing speed (note : the model 4, below, showed the best fit to the data). Although processing speed strongly mediated the development of g in our study, it may have done so indirectly through cognitive processes such as encoding, inhibition, or retrieval. These other cognitive processes have been found to be related to each other and to processing speed (Carroll, 1993). However, processing speed is assumed to broadly constrain cognitive development by limiting the speed of all cognitive processes (e.g., Kail, 1991). Thus, processing speed would also be expected to constrain the development of g, which reflects all cognitive processes (cf. Jensen, 2006; Kail, 2000). Our findings are consistent with theories emphasizing the role of processing speed in children’s cognitive development (Jensen, 2006; Kail, 1991, 2000). These theories assume that increases in processing speed contribute to global improvements in cognition, which are observed as increases in g. Such improvements in cognition and g have been attributed to neural changes including increases in nerve conduction velocity, neuronal oscillations, and brain myelination (Jensen, 2011; Miller, 1994). A similar pattern has been observed previously. 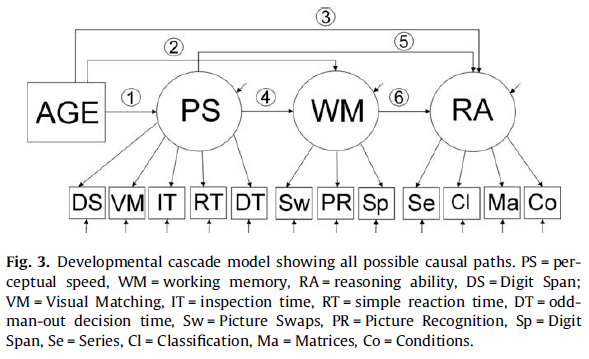 Nettelbeck (2010) managed to replicate Kail (2007) earlier SEM study in which age causes PS which in turns causes greater working memory (WM) capacity which in turns causes higher reasoning ability (e.g., as measured by Raven’s or Cattell Culture Fair Test). This model appeared to better fit (i.e., best explain) the data. Besides, in Nettelbeck’s sample, aged adults have seen a decline in reasoning ability due to slower processing speed but also by age-related factors influencing working memory but independent from processing speed. In the model fit on the longitudinal data, we used the speed and the working memory scores of the first testing wave and the gf scores of the second testing wave. That is, in the first group, speed and WM at 6, 7, or 8 are used to predict gf at 7, 8, and 9 years. In the second group, speed and working memory at 9 or 10 are used to predict gf at 10 or 11 years. To test the assumption that the structure of abilities does not vary with time but their relations might vary, we constrained all relations between measures and factors to be equal across the two groups and we let the structural relations vary freely. It is recognized that the relatively small number of participants in the two age blocks compared may weaken the statistical power of structural relations. To compensate for this problem the number of measurement in these models was kept to a minimum. The fit of this model was excellent (see Table 1). The relations between constructs are patterned as expected. In the younger age group, the relations between age and speed (−.71), and gf (.48) were significant and much higher than in the older age group (−.14 and 0, respectively). However, the relations between working memory and speed and working memory and gf were much higher in the older (−.44 and .64) than in the younger age group (−.28 and .49, respectively). Thus, it seemed that in the first phase speed reflected age changes because in this phase children became extensively faster in processing and relatively better in gf. In the next phase, gf changes converged increasingly with working memory, reflecting an across the board expansion of thought towards the capacity indexed by WM. Our findings about structure confirmed both the SLODRage prediction that cognitive processes differentiate from each other (prediction 4a) and the developmental prediction that they become increasingly coordinated with each other (prediction 4b). Differentiation was suggested by the fact that, with age, different types of mental processes are expressed through process-specific factors rather than through a more inclusive representational factor. These process specific factors tended to relate increasingly with a general factor at a subsequent phase, reflecting an integration of previously differentiated processes. This concurrent differentiation/integration of cognitive processes necessitates a redefinition of the nature of cognitive development. Our findings suggested that intellectual power increases with development because cognitive processes and reasoning evolve through several cycles of differentiation and integration where relations are dynamic and bidirectional. According to the present and other research (Demetriou, 2000; Demetriou & Kazi, 2001, 2006; Flavell, Green, & Flavell, 1995), differentiation goes from general cognitive functions to specific cognitive processes and mental operations. Integration follows the trend, focusing on increasingly specific processes and operations. Differentiation of cognitive processes allows their control because they may be individually regulated according to a goal-relevant plan. Integration of mental operations generates content-free inferential schemes that can be brought to bear on truth and validity. In both differential and developmental theories, the differentiation/integration process always applies on inferential processes. Moreover, in developmental theory, the state of their coordination frames the functioning of all other cognitive processes, such as language, mental imagery, and memory, imposing a stage-specific overall worldview (Piaget, 1970). At the biological level, Penke et al. (2012, Figure 2) conducted SEM analysis to test the possible pathways from three different indicators of white matter tract integrity to general intelligence (g). They discovered that this path was fully mediated by information-processing speed. They made this assumption since efficient information processing between distal brain regions is thought to rely on the integrity of their interconnecting white matter tracts. Well-connected white matter favors efficient information processing. See also Jung & Haier (2007) who emphasized on brain functional connectivity to explicate the neural basis of intelligence. This aside, IQ-achievement tests of causality being the most needed, Watkins et al. (2007) conducted such a test using SEM to estimate the arrow of causality of IQ (test) latent factors and achievement (test) latent factors across two points in time. In sum, a cross-lagged path analysis. 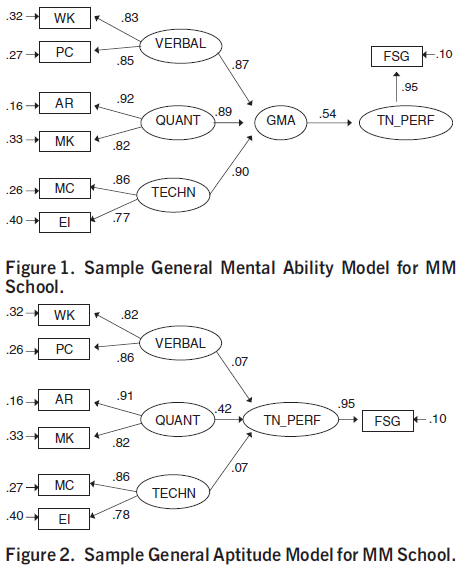 Their model 2 (M2) in which each of the IQ latent factors at Time #1 had direct paths to the IQ latent factors and achievement latent factors at Time #2 (with Achievement1→IQ2 path being not significant) has been selected as the best-fit model to the data, whereas alternative models (e.g., M3, which assumes direct path from achievement latent factor Time #1 on both achievement latent factor and IQ latent factor at Time #2) were not. If father education and occupation each have a direct coefficient of 0.20, this implies that the two variables explain 0.20^2+0.20^2=0.08 or 8% of variation in childhood IQ. Moreover, to the extent that the coefficient from childhood IQ to childhood education is 0.44, the coefficient from childhood education to adult IQ being 0.25, then the indirect effect of education on adult IQ would be estimated at 0.44*0.25=0.11 or 11% of the variance. Apparently, education wasn’t really a strong causal determinant. 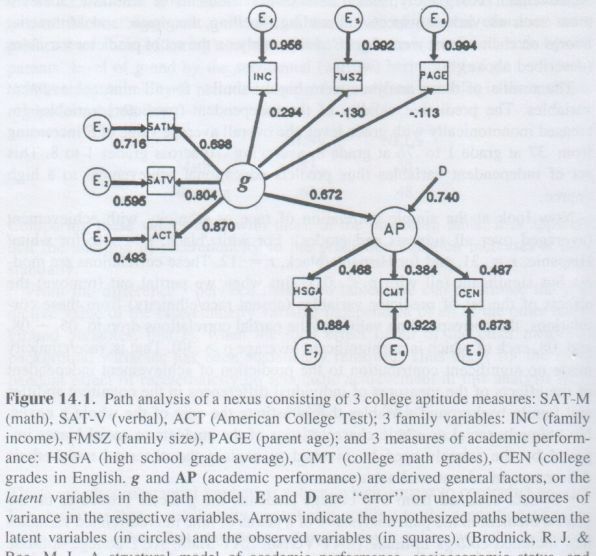 Consistent with the idea that SES is not of so great importance, Brodnick & Ree (1995) investigated the structural relationship between g (SATm, SATv, ACT) and SES (income, family size, parent’s age) and academic performance (AP, diverse GPAs) by way of CFAs. Among these 3 latent variables, they found that SES had no explanatory power. The model which best explained the data is a model g+AP in which there was no direct path connecting the 3 SES observed variables or even the SES common latent factor to the latent AP or its observed elements. g has a path of 0.672 going to AP, thus accounting for 0.672² or 45.2% of variance in AP, with D being the unexplained variance of AP which is 0.740² or 54.8% (i.e., 45.2%+54.8%=100%). Because a g-only model shows no fit decrement as compared with a g+SES model, this would mean that using a separate SES latent variable when g had been incorporated is not very useful. That the authors used SAT/ACT to derive a latent g might be questional to some, but Frey & Detterman (2004), Koenig et al. (2008), and Coyle & Pillow (2008) confirmed that SAT and ACT are good proxies of g.
This result may be explained by statistical artifacts, precisely, that family size and parental age are inaccurate measures of SES, hence the absence of increment in model fit when latent SES is added. In the NLSY97 and NLSY79, this couldn’t be replicated but the independent impact of adolescents’ intelligence was stronger than the independent impact of parental SES on outcome. Cross-lagged analyses had been applied at the nation level as well by Rindermann (2008a, 2008b, 2011, 2012). Earlier IQ levels predict better economic performance measured at a later time, although the Beta coefficients were not usually very high. The coefficients from early GDP to later national IQ are significant as well, suggesting that the causality runs both ways. On the other hand, early level of education predict later GDP while early GDP predicts only weakly later levels of education. Generally, if the causal link with regard to IQ seems to be well established, the idea of the general intelligence, the g factor, as a causal entity of mental abilities is prone to uncertainty (see, van der Maas et al., 2006). Nevertheless, in a twin study, Shikishima et al. (2009) tested two competing models concerning the causal role of the g factor : the independent pathway versus common pathway model. In the first model, genetic and environmental factors influence specific cognitive abilities through a direct path. In the second model, genetic and environmental factors influence specific cognitive abilities through a higher-order construct, say, the g factor. The analysis shows that the (AE) common pathway model (having the smallest AIC values) fitted their data best, meaning that the causal role of g has been established. This obviously counters claims made by scientists like Stephen Jay Gould who used to consider g as a mere statistical phenomenon. This entry was posted in Psychometrics and tagged QI.